Has there ever been a world leader whose appearance demanded attention as much as Indira Gandhi's? With that shock of black-and-white, Cruella de Vil hair, unmistakable nose, and fiercely intelligent eyes, hers was a face made to be on the front page of the newspaper if ever there was one. She died nearly 27 years ago, but her impact lives on in India - and not just through the fact that her family name remains the most powerful one in the country's politics. She was assassinated at her home in Delhi, which has now been turned into a memorial to her and to her son, Rajiv, who succeeded her as Prime Minister in 1984 and was assassinated in his turn. My visit there today was a claustrophobic affair. The site of the martyrdom - for that's what it is seen as - of the nation's favourite daughter is a place of pilgrimage for Indians, who jostle and cram their way into the somewhat cramped exhibition halls - covered with newspapers spanning the decades of her career and Gandhi family photos - and have a habit of thrusting their mobile phones in front of the display you are looking at, in order to get a snap. It didn't allow for a great deal of peaceful contemplation of Indira's impact, but it shows just how large a figure she still looms in Indians' minds. She herself was imprisoned by the British - and, years later, by her political opponents in India. She served as Prime Minister for a total of fifteen years, including during Bangladesh's successful war of independence against Pakistan, in which India played a decisive role. She was famous for her sharp political instincts, that helped her stay in power for so long, and must have cut an intimidating figure. She was fiercely committed to improving conditions for India's poor, and drove through the Green Revolution that allowed the country to feed itself. But she was also responsible for some of the darker moments of India's post-independence period, including a 21-month state of emergency (proclaimed on rather tenuous grounds) which allowed her to rule effectively by decree, and the event that would lead to her assassination, the storming of the Golden Temple in Amritsar in an effort to root out separatist Sikhs calling for the creation of an independent "Khalistan" in the Punjab. Among Sikhs, unsurprisingly, she hardly cuts a popular figure, and she inspired unusual ire among her political opponents, as well as Richard Nixon (so she can't have been all bad). But for most Indians, she is remembered as a great national leader of a status comparable to her father. Unsurprising, then, that the memorial museum tends towards the hagiographical: the State of Emergency and the violence in Amritsar are brushed over, and no mention is made of the immediate aftermath of Indira's murder, when thousands of innocent Sikhs were killed - many burned alive - in revenge attacks across Delhi and elsewhere in India. The violence of Rajiv's death - he was blown to pieces by a suicide bomber - is clear. For some reason though, it was the socks that moved me - oddly intact, just grubby, as though Rajiv had been out for a run and dumped them on the floor afterwards, and incongruous with the solemn museum setting. Anyway, after musing on Indira's life and death, I made the ten minute walk to the spot where another Gandhi - even more famous than Indira - was also assassinated. The place where Mahatma Gandhi was killed is also preserved as a memorial, but was far less crowded than Indira's. This got me thinking about the meaning these two people - who were close personally but very different in their historical roles - have for the country today. Others are much better qualified than me to judge, but to me the bigger crowds at Indira's memorial reflect the fact that for modern India, her shadow is longer than the Mahatma's. Mahatma Gandhi is, and always will be, an iconic figure internationally, and India continues to hold him up as a role model and one of the founding fathers of independent India. But for all that people profess to admire his ideals, few Indian public figures since then seem to follow them much. Certainly his frugal lifestyle is not often followed by those Indians who have a choice in the matter. His condemnation of the oppression of women and of caste distinctions have not prevented them remaining widespread in India more than 60 years after his death. Even in my own area of vocational education his words sound at odds with prevailing attitudes here: Gandhi said that "instead of regarding craft and industry as different from education, I regard the former as the medium for the latter". That's not a popular view in a country where work-related education is still associated with low caste and low prestige in many circles. I say this more in observation than condemnation, for if India had followed Gandhiism, I suspect it would be rather worse off now than it is. The pursuit of wealth may have created some very ugly inequalities, but it has also allowed for economic growth that has lifted millions out of poverty. Ultimately, Gandhi's asceticism was something he chose - because he was in a position to make that choice. Most Indians - like most people elsewhere - don't make that choice. It makes him an extraordinary person, and an admirable one, just as his approach to challenging British rule proved astonishingly effective. But it doesn't mean that his way is in any sense practical as long term public policy. 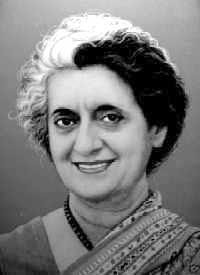 Indira, though, in her awareness of her own power, her willingness to use it and her belief - no less than Gandhi's - in the cause of India, seems to me to have more in common with the increasingly assertive and confident country India is today. That has some good consequences, and some potentially scary ones - the India-Pakistan relationship being top of the list of the latter. Modern India, nuclear-armed, accustomed to sabre-rattling and struggling with rampant graft, seems to have a politics that owes little to peaceful, self-denying Mahatma Gandhi. In this, I guess it is little different to the rest of the world - where he is held up an admired as an inspiration, but where politics dance largely to a different tune. One that Indira knew better.